This is a Friend module plug-in for SLDataText. - Left Click: Send /tell to that person. 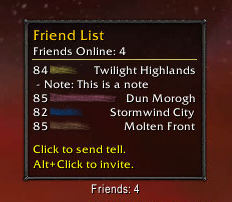 - Alt+Left Click: Invite that person to a group. Inherits all other SLDataText related features, including configuration. Use '/sldt Friends' to access menu. BNet features may cause problems. If any errors relating to BNet become and issue, please report them with detailed errors so I can fix them as soon as possible. Thanks! 2x [ADDON_ACTION_BLOCKED] AddOn "SLDataText_Friends" tried to call the protected function "VoiceChatTalkers:Hide()". EDIT: Apparently Blizzard gets picky with toggling frames while in combat, does the same for my addon for any frame I try to toggle in combat. It still toggles the frame but you gain a random Lua error. Last edited by Mayron : 09-18-14 at 01:50 PM. can you please make a russian localization (ruRU)? This addon is amazing but it doesn't work on my RU client..
A couple of questions. First, how to get rid of the icon before the "Friends:" text? Second, is this the final design version? Because I very much prefer the old version. Both questions apply to the guild plug in as well. The old version used an old tooltip library that was Ace2 based and fairly bloated, and I didn't like the alternatives that were available based on the idea of keeping the AddOn as lightweight as possible with as many features as I could provide. So I created my own Tooltip library that has the same functionality but is lightweight (at the sacrifice of a little bit of info & style). I, too, preferred the old tooltip. But really all I want from it is the class color and the friend's location. Hi Taffu, is it possible for you to include an option to show this module during combat? You did this for the guild module and i'd really appreciate if you could do it for this module too. Thanks! Same question in line with "old version". Fine with everything, just wondering if we can get class coloring on toon names for RealID/Tags? Alright. Is there any way of getting the old look back though? I don't really mind if it's not lightweight. In case you didn't notice already, BNGetFriendInfo() has been changed with 5.0.4. "Replaced givenName, surname with presenceName, battleTag, isBattleTagPresence"
Any idea, when 1.0.8 will come? Sorry, I meant 1.0.4. I'm looking into the issue with it returning booleans instead of names for the BNet API...I'll try to get a working fix done today. still not really working with the german client! Not working on EN either, so most likely it's just broken because of all the changes to the game. I'm not having any errors aside from a Battlenet parse error, which should be fixed in 1.0.8. Adding friends works, and it properly reflects my current friendlist. Regarding locale clients: I have no way to check the accuracy of non-english clients. I assume those who have submitted translations checked before doing so to make sure it was working. If the deDE locale file isn't working, I need the working translations based off the "current enUS" file.